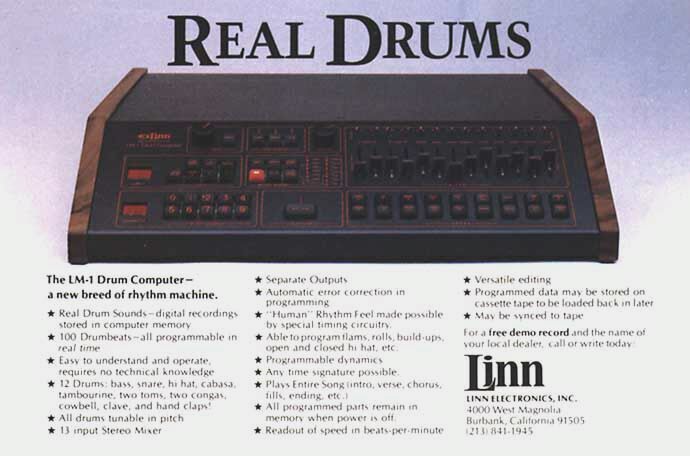 The LM-1, Roger Linn's first commercial drum machine, was the first programmable drum machine to feature sampled sounds. It featured "twelve 8-bit samples (kick, snare, hi-hat, cabassa, tambourine, 2 toms, 2 congas, cowbell, clave, and handclap). All sounds were tunable". There were a total of 100 programmable patterns which could be programmed in realtime or steptime, featuring variable swing-time and quantization programming functions. The programs were chained together to make a song. In addition to each sound having its own individual output, there was also a built in 13-channel mixer. Each sound had its own control for pan and level and was outputted to two main output pairs (for hi and low level). The LM-1 featured tape sync, data storage connectors, and a footswitch input. There was a clock output with variable pulse frequency and an external clock input. The first 35 LM-1's were "assembled in Roger Linn's home. Then Bob Easton of 360 Systems took over LM-1 manufacturing. Earliest LM-1's featured engraved buttons, but lacked front-panel controls for swing-time and quantization functions and weren't up to the quality standards set by those manufactured by 360 Systems." "'I believe the LM-1 sounded better because I didn't incorporate strict textbook digital sampling theory. By the book, I should have filtered out any playback frequencies above the Nyquist frequency, which is a little less that one-half of the sampling frequency. I used a sampling rate of around 27kHz. However, filtering on playback would have made some of the drums sound pretty dull. Instead, I let some of the frequencies above that point get through, because the results - which can get distorted - sounded like the sizzle of drums anyway. Thanks to that decision, the LM-1 sounded better than some drum machines with the same sampling rate, because it had the highs. In a sense, I'm thankful that I wasn't very good at the engineering.'" "Linn's shuffle feature was unique in the drum machine world, and it's found on every device he's manufactured.... On the front panel of all but the earliest LM-1s is a column of six red LEDs, labeled from 50% to 70% in increments of 4%. Linn explains: 'In order to create a sixteenth-note swing or shuffle feel, you unevenly split the timing of an eighth-note, thereby delaying every second sixteenth-note by some time factor. The LM-1 percentages signify the interval between the first and second sixteenth-note and between the third and fourth sixteenth-note, and so on. If you want both notes to play perfectly even - no shuffle - you would select 50%, which means 50/50. If you make it one clock later, it would be 54/56, or 54%. Delaying it two clocks makes it 58/42, or 58% for the first half and 42% for the second half.'" "Linn realized early on that musicians could get more out of his sampled drum sounds if they were tunable, and if each sound had a separate output, so that they could be routed to different effects processors. Another feature found only on his drum machines is a knob for varying the hi-hat's decay. It was on the LM-1's back panel." "Even before the LM-1 went into production, Linn was able to drum up (pun intended) buyers. They must have wondered what they were in for, though. 'I had a prototype that wasn't actually producible, basically a cardboard box with a bunch of wire-wrap boards mounted inside. But it worked. I would show it to people who had come over to my house, and they would give me 50% deposits on the finished product. On occasion, I would take this cardboard box down to somebody's session and show it to them. It was pretty hilarious. "'Later, when I had a real prototype, I'd keep it in my car. At one party, I showed it to some members of Fleetwood Mac, and I generated some sales from that.' ... 'I used to play with Leon Russell, so he bought one. Stevie Wonder bought one of the first ones. Boz Scaggs bought one. So did Daryl Dragon (the Captain), Peter Gabriel.'" "If you check out [the] list of LM-1 sounds, you may note that there weren't any cymbals. Bob Easton, whose 360 Systems took over the manufacturing of the LM-1, filled the gap. 'Bob manufactured two cards that he would install into LM-1s to provide cymbal sounds; one card was a crash and the other a ride. Each card had about 32K of memory.'"